This week, in Charlie and the Chocolate Factory week, you will be able to earn yourself Golden Tickets. Not only will these be worth 5tokens towards your house total, but you will also be entered into a prize draw to win lots of chocolatey goodies as well as other prizes. Once you have collected you Golden Tickets, it would be really great if you could comment below, explaining how you earned your ticket. You might even want to nominate someone if they have done something incredible. Tell us who, along with a really great explanation of why they deserve it. Really go for it this week- be brilliant! To get a golden ticket you be polite and be happy.Also to get a ticket you use the learning habits. You need good homework and a good attitude to learning. You need neat handwriting. I got a golden ticket for reading every day. If you read lots you learn more things. I also got a golden ticket for doing my sunflower project. I measured my sunflower every week and made a graph with cubes. It is 12cm tall. It has a stem, leaves and roots but it doesn’t have a flower with petals yet. Fantastic home learning Alice! You really do make the most of every opportunity don’t you! Hi I’ve got a golden ticket for helping other people. Put your hand up for what you think the answer is and if you get it wrong learn from your mistake and try to answer the question a different way. If you don’t succeed try and try again. Challenge yourself! Push yourself to try and become the level you believe you want to be. Dream, believe, achieve. Always believe. Even if you get the questions wrong or if you forget something, that will help you for next time. I believe in all of Oakthorpe school and everyone to be their ideal selves! 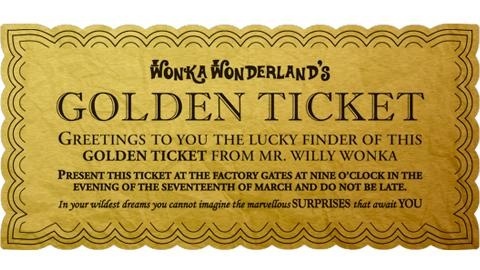 I got a golden ticket for bieng kind to evry one in my house. I also got an nother one for bieng confident and postive.